This article is about the drone laws in Cameroon. 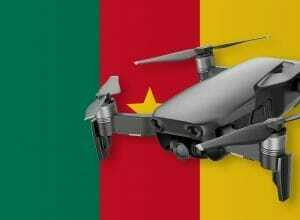 To bring a drone to Cameroon, you need a permit from the aviation authority. You must submit your request at least 30 days in advance. The aviation authority then requests the Ministry of Defense and checks whether the conditions have been met. Maximum altitude: In Cameroon, your drone must not ascend more than 120 meters above ground. Maximum horizontal distance and FPV: The use of multicopters in Cameroon is only allowed within sight. The maximum distance between the drone and pilot must not exceed 300 meters. Compulsory insurance: No information available yet. Maximum take-off weight (MTOW): No information found yet. Distance to airports: At airports, a distance of 5.5 kilometers must be maintained. Other safety distances: Your copter must always maintain a lateral distance of at least 15 meters to the following objects: Any structures such as buildings, vehicles, ships, animals and persons. Drone bans: Drone flights are not allowed when there are many people in the area (such as demos, stadiums, markets). Operating Hours: Drone flights can only be done between sunrise and sunset in right weather conditions. Requirements for commercial pilots: Commercial pilots must follow the regulations described above. We have researched the listed drone regulations for Cameroon to the best of our knowledge. We cannot guarantee the correctness of the information. If you want to be on the safe side, contact the competent aviation authority. Alternatively, you can also ask the embassy in your country for further information about the regulations. Please leave us a comment when you receive news and/or gain experience with your copter in Cameroon! I was researching for drone laws in a few countries that I will be visiting for a job and your site is very useful. I am a commercial drone operator based in Singapore. Hope to see you visit Singapore one day.